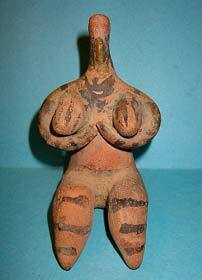 In Asia Minor and Mesopotamia by 10,000 BC, people had long since abandoned cave dwelling. Many remained hunter-gatherers, but some had abandoned a migratory way of life in favour of living in the earliest permanent settlements amidst the prevailing hunter-gatherer populations. However, while some of these settled locations such as Gobekli Tepe in Asia Minor were being abandoned by 8000 BC, those in Mesopotamia continued to thrive. People were utilising and storing a wide range of natural resources in favoured areas of what is now northern Iraq. Between 8000 to 7000 BC, the first evidence of domesticated grains (wheat and barley) and animals (sheep, goat, pig, and cattle) could be found at Jarmo, and baked clay female figures were being made at Mureybit. By the end of this period, plastered semi-subterranean houses anticipated the development of mud brick, sun-dried clay as the main building material throughout later Mesopotamian history, and the earliest pottery was made and used for the preparing, serving, and storing of food. The grinding and working of fine stone vessels and statuettes, particularly the styles named after the sites of Samarra and Halaf, was well established by 6000 BC. Clay impressions of carved stamp seals were being made at Sabi Abyad in north-eastern Syria. These seals, originally applied to a variety of containers to signify ownership, or responsibility for property, are thought to indicate some measure of early administrative control. There is also evidence for the exchange of goods over thousands of miles. Agricultural settlements of the Halaf period, at around 5500 BC, extended all across north Mesopotamia. Many resemblances between them indicate a shared culture and social organisation. Their most distinctive feature, a painted pottery of outstanding quality, was manufactured at many different centres. 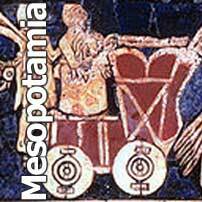 Little is known of south Mesopotamia before 5500 BC, but some centuries later the influence of the southern Ubaid culture, characterised by its distinctive painted pottery made on a slow wheel, extended throughout the north. 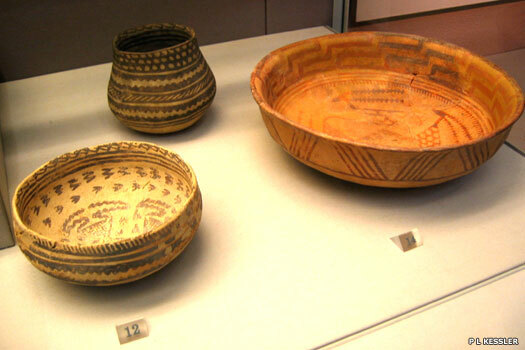 As the culture spread, local pottery styles were replaced throughout Mesopotamia extending into the eastern Mediterranean, Iran, and the Arabian Peninsula. At Eridu, in the far south, an early shrine can be traced through many phases of rebuilding, becoming ever more massive, to its transformation in historical times into a major Sumerian temple, a striking example of continuity in this region. Smaller Ubaid villages gradually give way to fewer but larger settlements in the south. From this, the Bronze Age Uruk culture emerged, with cities appearing throughout the region, heralding the end of prehistoric Mesopotamia. The first stage, then, is to explore the Hassuna culture (see sidebar links). Images and text copyright © P L Kessler, including exhibits at the British Museum. An original feature for the History Files.